Lens Displacement is defined as the partial or complete breakdown of the zonular attachments. A healthy lens is located behind the iris and is attached by a tiny meshwork of fibers called lens zonules. There are two forms of lens displacement, Subluxation and luxation. Certain breeds such as toy fox terriers, and blue heelers are predisposed to lens luxation, while geriatric patients are prone to this disease. 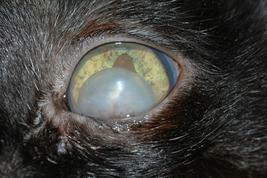 Luxation can be secondary to glaucoma, ocular trauma or spontaneous. What is the difference between subluxation and luxation of the lens? -Subluxation is the partial breakdown of the lens zonules. In this process, the lens shifts from its original location. The lens zonules are still partially attached to the lens, but how long it will remain so is uncertain. -Luxation is the complete breakdown of the lens zonules. In this process, the lens is free floating in the eye. When this happens, the lens can be pushed into the anterior chamber and trapped there by the iris. 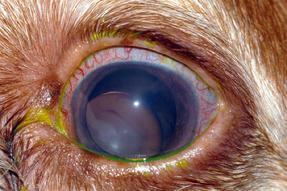 This situation can rapidly increase the intraocular pressure and is considered an emergency. What is the treatment for lens displacement? Typically, medical treatment and quarterly recheck examination are offered to those with lens subluxation. Patients with lens luxation are usually required to have lens removal surgery, however medical therapy can be utilized as well. What is the difference between cataract surgery and lens removal? Cataracts form on the natural lens inside of a small membrane called the lens capsule. During cataract surgery, a small incision is made in this capsule that allows the surgeon to shatter the cataract by ultrasonic vibration and aspirate the remains through a small needle. The lens capsule remains intact (held in place by the lens zonules) and a prosthetic lens is inserted in place of the natural lens. When the lens luxates, the zonules are no longer attached to the lens, so the surgeon must remove the lens as a whole. Intraocular lens implantation is not possible due to the absence of zonules and the lens capsule. Will my pet see after the lens is removed? Patients have poor near vision and poor night vision after surgery. Night lights are considered useful for household navigation in the evenings. Vision is functional for the needs of a pet. This is an example of lens subluxation. The lens has dropped from its normal location, and exposed the outer rim. This exposure is called the Aphakic Crescent. This is an example of anterior lens luxation. The lens is free of all attachment and is in the front of the eye. This eye is prone to develop secondary glaucoma is a candidate for lens removal surgery.